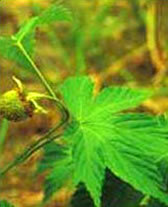 Fructus Rubi chingii is the dried fruit of Rubus chingii Hu (Fam. 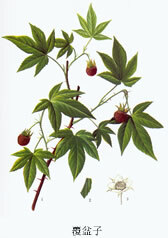 Rosaceae). The drug is collected in early summer when it turns from green to greenish-yellow, removed from fruit stalk and leaf, treated with boiling water for a moment or steamed briefly, and dried. The herb is indicated in the treatment of spermatorrhea, infantile enuresis and male infertility, etc..
Pattern: Nourishes the Kidney, stops emission, arresting polyurina. Properties: Sweet, sour, mildly warm. Channels Entered: Liver and Kidney. The herb contains citric acid, malic acid, oxybenzoic acid, volatile oil, pectin, glucose and some Vit C and A.
fu pen zi could inhibit the growth of comma bacillus in vitro. Nocturnal emission and spermatorrhea, etc. fu pen zi 10g; shan zhu yu, qian shi, 12g each; zhi mu, huang bo, wu wei zi, 10g each; shan yao 15g, water decoction, taken warmly in two ~ three times. The method could be used to treat enuresis, nocturnal emission and spermatorrhea of the pattern of yin deficiency of the Liver and Kidney, and hyperactivity of Fire due to yin deficiency. fu pen zi, sang piao xiao, yi zhi ren, jin ying zi, wu yao and shan yao could be used to treat senile frequent urination and prostatic hyperplasia. Basic formula: fu pen zi 10g; wu yao 10g; yi zhi ren, sang piao xiao 12g each. Group 1, basic formula combining with Bu Zhong Yi Qi Tang removing dang gui, 42 cases; Group 2, basic formula combining Wu Zi Yan Zong Wan removing che qian zi, 61 cases; Group III, formula consisted of previous two formulas, 61 cases. 1 dose every day, taken in three times. There're 16, 28 and 37 cured cases , 11, 15 and 17 improved cases in the three groups respectively. The total effective rate was 64.29%, 7049% and 87.5%. Carrot 500g (boiled as diet, and the left water was used to decoct the drugs); tu si zi 60g; nu zhen zi, gou qi, fu pen zi, wu wei zi, bu gu zhi, jiu cai zi, che qian zi, shan zhu yu, 15g each; sang shen, 30g, zhi gan cao 5g. Modify the formula according to accompanied symptoms. 1 dose every day, 30 days as a course of treatment, 20 days~5 months totally.489 cases were treated, and 331 were cured.